From kimono robes and cosy cardigans to chic structured jackets, sequin-coated crop tops and beautiful, billowing boho capes, literally anything constitutes a ‘bridal’ cover-up these days. It’s an exciting time to be getting married not only because you’ve found the love of your life (go you! ), but because you can walk down the aisle with them in whatever item of clothing you so happen to love too! While noted designers such as Pronovias, Rosa Clara and Justin Alexander are offering beautiful boleros, beaded capelets, fur shrugs and stunning sheer stoles to adorn a wedding dress whatever the season, ‘indie’ designers are opting to go for more trendy options, mimicking the high street with their contemporary take. 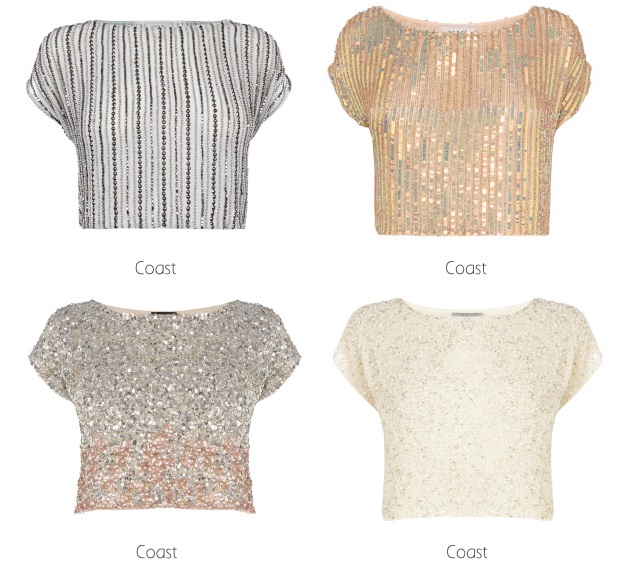 There are so many styles to choose from however that it’s easy to get overwhelmed with choices. The way to find your consummate cover up is to firstly find your dress (don’t even try to do this the other way around!) and decide if you’d like to add a totally different bodice to it for a portion of the wedding day (if so we’d suggest splashing out on a piece from the designers mentioned, or opt for a crop top cover up from the high street, if not, read on). Secondly, play around with shapes and textures and don’t be afraid to try something you don’t think will work (as so often with these things, it does). Thirdly, go for something you love and will wear again and finally, make sure that something is something that doesn’t break the bank. 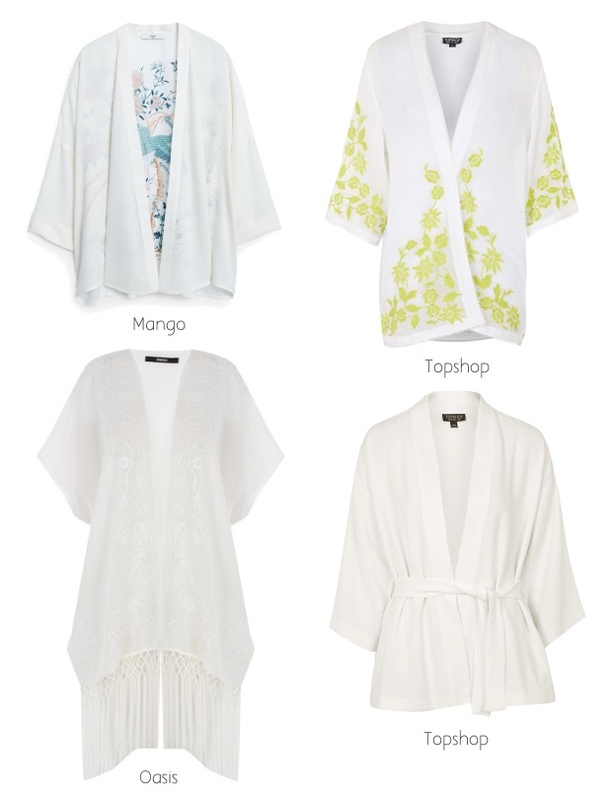 So there you have it, our quick guide to the new bridal cover up – check out our pick of the best styles currently on offer on the high street and get thinking outside the bridal box! 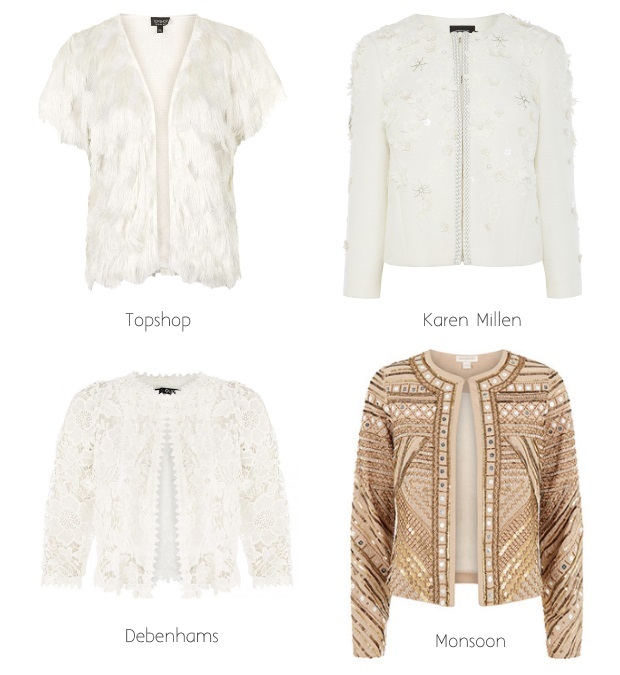 The embellished jacket was a nice transition piece on the high street this year but it’s an all-rounder when it comes to weddings. These pretty pieces are perfect for brides in chic separates (cami/crop and pencil skirt) or for those opting for a simple silk sheath gown. Embellishments can be fussy, especially when paired with unusual textures or prints, so the trick is to only don one of these guys if your dress is a bit understated (although we wouldn’t say no to matching embellishments on the bottom of the skirt, that’d be gorge). 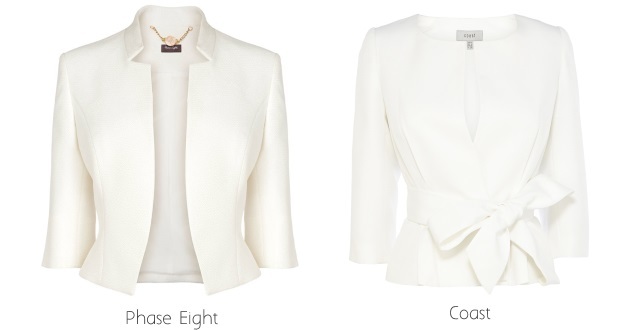 The structured jacket is no longer confined to the older members of the wedding party, it can look equally chic on the bride herself. A structured style is a great way to add some edge to a delicate wedding dress, where clean lines contrast beautifully with a softer, more playful gown. Play around with the shapes here and don’t be too concerned with your jacket looking boxy as it actually works really well with more voluminous skirts (and if you don’t believe us, check out Rosa Clara’s back catalogue). The crop top spent most of 2014 sneaking into mainstream wedding fashion with its adorable sparkles and questionable length and sure enough it’s found its way into all our hearts, especially when worn as a cover up! 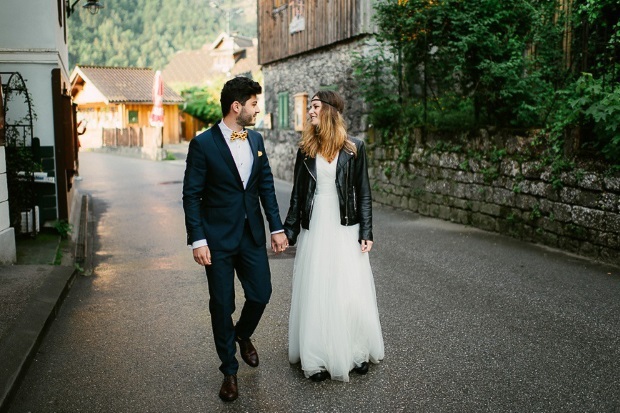 We’ve noticed brides in real weddings being photographed from one end of the day to the other in what seem like two different gowns, but sure enough it’s the crop top at work cultivating entirely new creations in a simple t-shirt change. If you want to opt for something trendy on the day but are afraid of your photos dating, this is the one for you. There will come a part of the Big Day when you’ll want to wrap yourself up in a little personal blanket, feel all cosy, and maybe let a little bit hang out while you’re at it, and that part usually comes just after the dinner. But no need to pop up to the bridal suite and miss the fun – instead, continue to look like a radiant Goddess, glowing in a flowing kaftan. Kaftans are popping up in all textures and lengths and will look incredible with a strapless sheath or A-line dress. Oh God, we want one on us right now. No need to think it’s only considered a cover up if it’s light and breezy, a chunky cable knit cardy, biker jacket or duster coat are all welcome to the party this year. 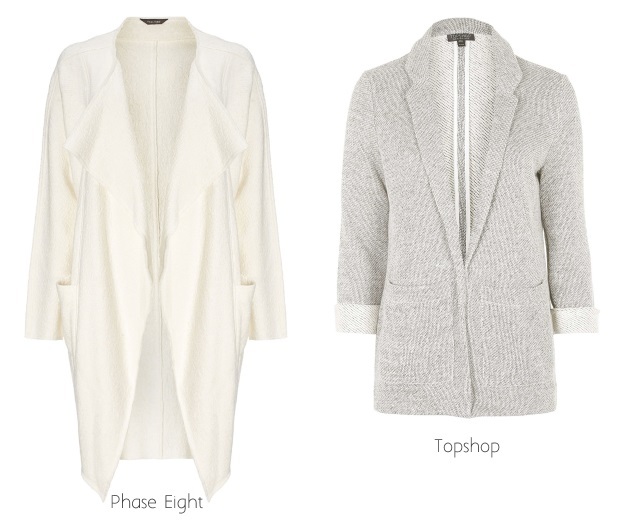 We love the idea of an oversized blazer on a pretty, feminine gown, or a chic trench or duster coat enveloping a glamorous guna. Our theory is if you like it and it makes you feel happy, comfortable and warm, wear it. Sure there’s nothing new about that. Main photo by Land of White Deer Photography, check out the full wedding on Lovemydress.com.